MINNEAPOLIS – Cargill’s “Cocoa Promise” in Ghana proves how corporations can benefit from running sustainable agricultural systems in the developing world. As a leader in corporate practices for agricultural production, the American company simultaneously promotes economic growth and human development. This represents an important development in the fight against global poverty, as there are 1.5 to 2 billion farmers who not only represent the largest producers of agricultural commodities worldwide, but also the majority of the world’s poor. Cargill’s Cocoa Promise is the company’s commitment to make a difference in sustainability in three key areas: training cocoa farmers; supporting cocoa farming communities; and investing in the long-term sustainable production of cocoa. This stands in stark contrast with the now fading short-term practice of speculative land-grabs where investors look for quick returns at the expense of the local population and food supply. In Ghana, Cargill formed a public-private partnership between the Ghanaian Cocoa Board, a locally licensed cocoa buyer, the Solidaridad NGO, and local Ghanaian farmers. The Cocoa Promise was pledged by Cargill in 2012 to partner with such entities in order to make a difference in the lives of farmers while also securing a consistent supply of quality cocoa. Cargill is a global food trader and food processor taking agricultural commodities and selling them to customers including food and beverage manufacturers, foodservice companies and retailers. Cargill Cocoa & Chocolate offers the food industry a wide range of both standard and customized cocoa and chocolate ingredients to be used in delicious bakery, confectionery, and dairy applications all over the world. Cargill has a presence in all the leading producers of cocoa including Ghana, Côte d’Ivoire, Cameroon, Vietnam, Indonesia, and Brazil. In April, 3,900 Ghanaian farmers received their first premium payments for the first yields of sustainable certified cocoa beans. 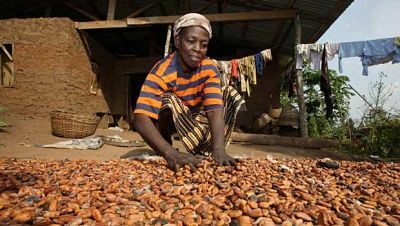 The certification helped expand the market for these farmers’ cocoa and improve the price paid for it. This stemmed from Cargill’s Farmer Field Schools. The first phase of Cargill’s farmer training in Ghana involves teaching agricultural best practices in pruning, plantation renewal, cocoa fermentation methods, and good environmental and social practices. Moving into its second phase, farms are thoroughly mapped to determine precise yields and soil is tested for optimum growing conditions. Furthermore, the training addresses broader social aspects including children’s education and HIV awareness. Cargill is on track to reach its target of training 15,000 Ghanaian farmers in the next three years. 2,500 tonnes of UTZ Certified cocoa have already been processed at Cargill’s state-of-the-art plant in Ghana, ensuring a large portion of the value chain remains within the country. UTZ Certified cocoa is part of Cargill’s efforts towards developing a sustainable supply chain, from the certified farmer to the final product as it becomes Gerkens® Ghanaian cocoa powders. More examples of sustainable agricultural practices abound. Sustainable palm oil production in Indonesia has led to increased farmer yields and incomes and has transitioned many from subsistence farming to ownership of viable agricultural businesses. Sustainable soy production in Brazil has helped significantly reduce illegal deforestation. And the environmental impact was also greatly mitigated in China when Cargill worked with over 6,000 Chinese smallholder corn farmers in Jilin Province. With the world’s population expected to grow from 7 billion to 9 billion in the next four decades, the demand on food and agricultural systems will be greater than ever. Consumers these days expect that the products they buy respect human rights. If properly implemented, creating sustainable agricultural systems in developing countries can lead to poverty reduction, increased food security, and good environmental stewardship throughout the world.